Meleanna Meyer (second from left) says 21st century learning is not about fact transmission, it's about finding motivation. 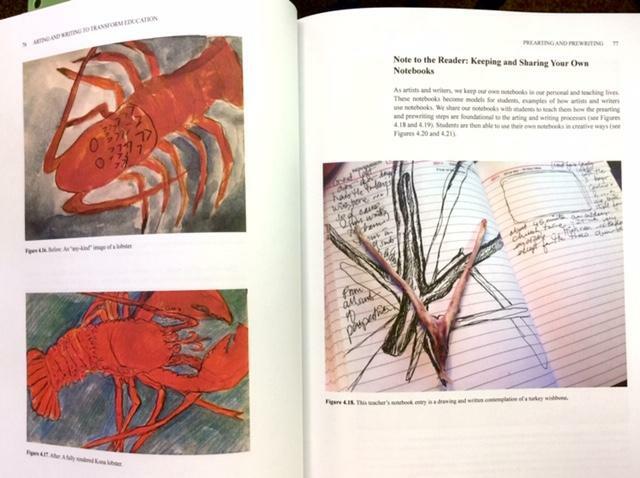 Arting and Writing uses close observation and lots of time to tease out what motivates learners. Three local educators have just released a book with Hawaii based activities and lesson plans that put their techniques to work. 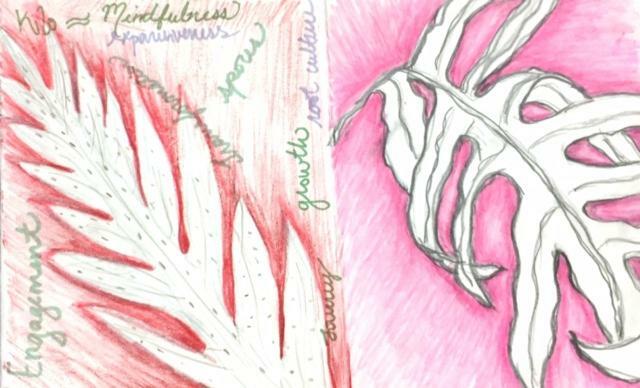 Recently, educators from Kamehameha Schools’ Ho’olaukoa Design and Strategies team gathered at Ho‘omaluhia Garden to experience a new teaching method called Arting and Writing. This approach uses Hawai‘i based ideas and the environment to help learners find their own motivation. One of the day's projects by Sylvie Fields. The first drawing (l) was done as she noted ideas, words that came to her head. The second drawing was made after encouragement from Meyer, and closer observation. Think of “arting” as Creative Making. Local educators, Anna Sumida, Miki Maeshiro, and Meleanna Meyer have written a systematic guide with lesson plans that combine making with writing for learners (haumāna) of any age. 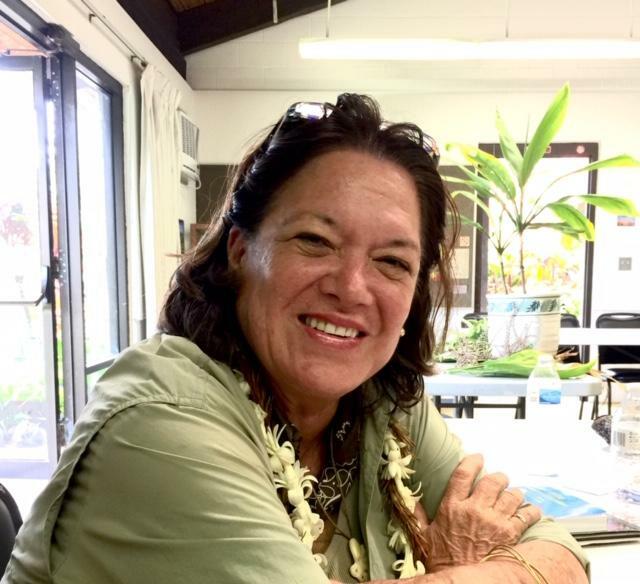 Sylvie Fields went through the process, she taught third grade for 19 years at Kamehameha Schools. Fields: If a child or haumāna sees himself in something they have a connection, so they stay with that and that can drive their learning. Fields: This whole arting and writing is about having them become creators. Giving them that space to access their identity and their passion and creativity. They become the experts and they can create something to share to the world. Fields points out, since technology can provide us with current information from global experts if you want to find them, the role of teachers is changing. One way transmission of facts and concepts alone, is not enough in the 21st century. What drives my desire to learn? How do I learn best? Artist, filmmaker, educator Meleanna Meyer says writers do writing, so clearly, artists do arting. Artist, educator, Meleanna Meyer, has worked with students in classrooms around the world, as they explore to figure that out. Meyer says Hawaiian style learning starts with close observation at home. So this edition of arting and writing is specifically for us. Hawai‘i. Meyer: Culture defines us. It animates us, it enlivens us. In the schools as teachers, as educators, we see the benefit and change in the children when they’re connected to their culture and when they’re connected to their best selves through their arting and writing. Meyer: And it’s not theoretical, you’re making something. Meyer says Arting and Writing are about not having subject matter in silos. The world isn’t like that and doesn’t work that way. We actually know this. Miki Maeshiro, educator, 20 plus years in the classroom, says for kids, they drive their own learning across subjects when they know what they want to learn. And you’d be surprised what it takes to get at that. ‘Olelo Hawai’i educator Miki Maeshiro says giving keiki time allows them to process input and respond to it in their own way. Maeshiro: What am I interested in? What drives me? What do I care about? This process is open enough where we’re able to pull that out and help them discover how they can take that into the world to have an effect and impact others. The idea of not just learning, taking in, but aiming to share with others---adding that component is key. 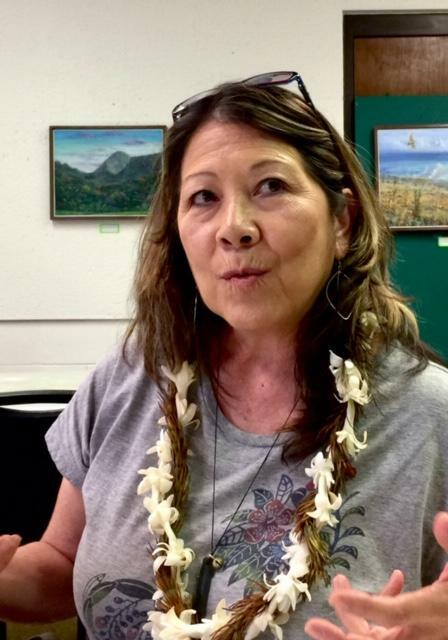 Anna Sumida was a teacher for 17 years, and director of a literacy outreach program when she met Meyer, the artist, and Maeshiro, the ‘ōlelo Hawai‘i resource. 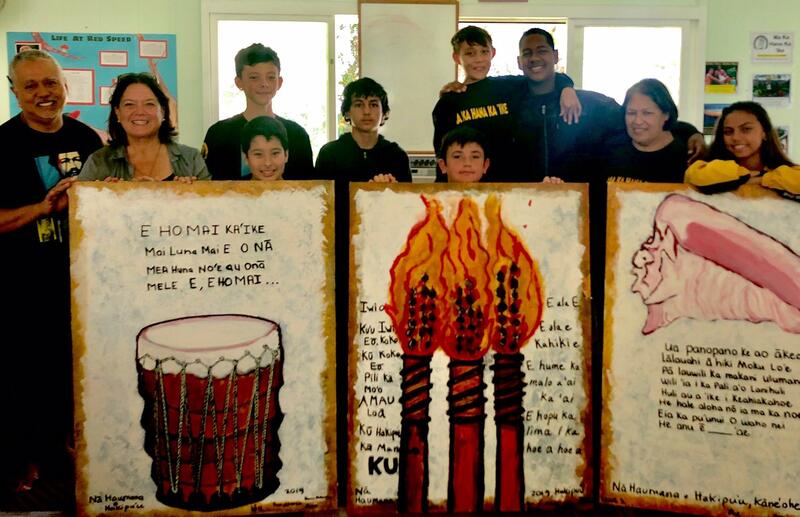 Her students had been making books with their newfound writing skills, and these two could help haumāna (students) tap into their own cultural and life experiences, then express them in engaging ways. Maeshiro: I guess part of it is the time and space and allowing for that kind of muddling around with the information, with the content, to find out what it is and make sense of it. Another of the educators there, Janine, said, the time available forced her to work through her original solution and go deeper, which allowed her to find another solution she could be proud of. That time spent muddling around leads to ownership. Sumida introduced me to the 4 T’s of education. T1 is teaching as it is in many places—straight one way transmission. T-2 is conversational, learning from each other. Teaching to the third power begins integrating creating and writing across disciplines. This is where educator Anna Sumida says transformational learning begins. Educator Anna Sumida says 21st century education is about allowing the uniqueness of each child to be expressed in the world. Sumida: Transformational is where you’re taking what is meaningful, functional, significant and then putting it out in to the world for others to use or to benefit from. Sumida: This is where, if we can get kids to be producers of knowledge and taking things out into world, that should be the ultimate goal of education! Then, learning becomes meaningful and powerful and you can never go back to just learning everything all in isolation or learning at a transmission T-1 level. How does Arting and Writing work? Sumida: As Miki was saying, we’re really allowing our learners the time they need to experience this messy kind of learning where things are not black and white, things are much more open ended. There’s so much freedom and safety in the fact you can come from a place of your na‘au (gut feelings) and express something. There’s nothing right or wrong about what you feel or what you know. Sumida: If we allow kids, in a learning environment to use all their six senses, you’re going to have amazing results, and that’s what I think 21st century teaching and learning has to be about. Sumida: It has to be about really unleashing the potential of creativity and what’s unique in each person. Let me into that classroom!!! Fields points out, what are employers looking for these days? Not anybody’s GPA. Today’s questions are: Can you collaborate? Are you creative? Can you problem solve? Are you a critical thinker? Educating for those attributes is something we in Hawai‘i can excel in. 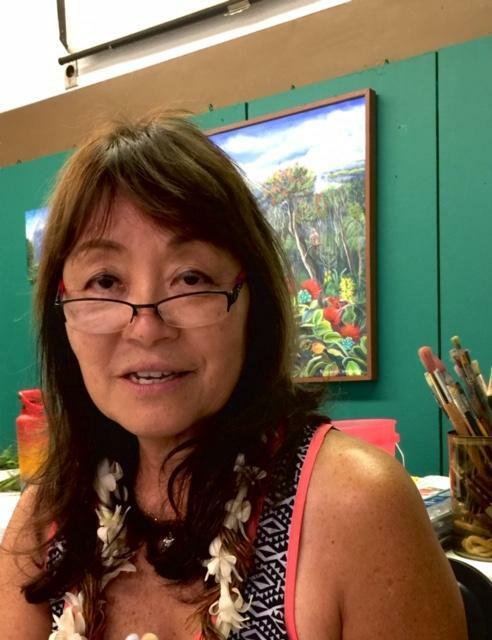 All Hawai‘i content, lesson plans, Meyer, Maeshiro and Sumida will be offering workshops for teachers. Vodka's Not the Only One Who Says, You Can Dance! Twenty-six percent of adults in the U.S. have some type of disability, according to the Centers for Disease Control and Prevention. That’s one in four Americans. As part of a movement to understand people with disabilities, a new dance approach has emerged – and it challenges norms onstage. Netflix’s popular Chef’s Table series introduces chefs worldwide who are creating fancy, eye-popping food. Unexpectedly, a Korean nun’s episode about temple cooking proved a favorite. Recently, Jeong Kwan was invited to Honolulu to cook and share her ideas with KCC culinary students and others.